I couldn't be happier with the beautiful results of my collaboration with artist Amy Sui ~ whose gorgeous script and calligraphy graces my marbled papers. 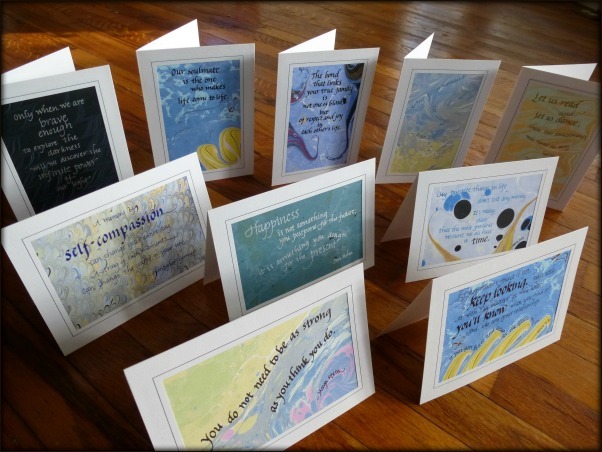 Together, we've created a collection of note cards which have inspiring, engaging, thoughtful, and uplifting quotes on them. Our first round of quotes sold out immediately. I've just updated the shop with our second round. If you're interested in purchasing, you can get them at the Peach Tree Holiday Show next weekend or you can email me (Cheers "at" BarbSkoog "dot" com). Check Out the New Note Card Store!